The Vanderbilt name is synomous with serious wealth. Having been to Newport Rhode Island I was amazed with the opulence of the 19th century wealthy industrialists’ summer homes. The 1974 adaptation of The Great Gatsby showcases Rosecliff and Marble House mansions in Newport. 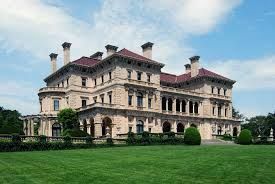 Then there is The Breakers built by Cornelius Vanderbilt II in 1895. On my recent East Coast road trip from Miami to New York, another ‘bigger home’ The Biltmore Estate was on the agenda. So driving from Charleston to Ashville North Carolina one of our objectives was to drive the Blue Ridge Parkway to take in the Fall foliage that peaks in October and visit this Estate. Not be outdone by another Vanderbilt and his summer home The Breakers, George Vanderbilt, grandson of Cornelius Vanderbilt, visited Ashville in 1888 and found the perfect location for his summer home. And what a home The Biltmore Estate is! Inspired by chateaux in France the Biltmore Estate on 8,000 acres and with 250 rooms is the largest private home built in the United States of America. Taking six years to build it is architecturally splendid, wildly romantic, and absurdly luxurious. It opened in 1895 when George was 33 years old – not a bad feat for someone so young! After touring the home, in small groups, we drove around the estate and stopped at the Winery for the obligatory wine tasting and lunch at the Bistro. An amazing experience and well worth a visit. There are around 3,000 visitors each day, so I recommend buying tickets in advance and also buying valet parking – this got us to the front door! Otherwise it is shuttle buses.